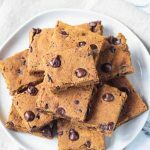 Pumpkin Chocolate Chip Bars – delicious dessert bars with all the flavors of fall and loaded with chocolate chips. Oil free and vegan. It’s officially October and that means – PUMPKIN! Are you ready for sweaters, boots, crunchy leaves, apples, cool crisp air, and all things pumpkin?? Or are you sad to see summer go? Fall is my favorite season and I wish it lasted longer. 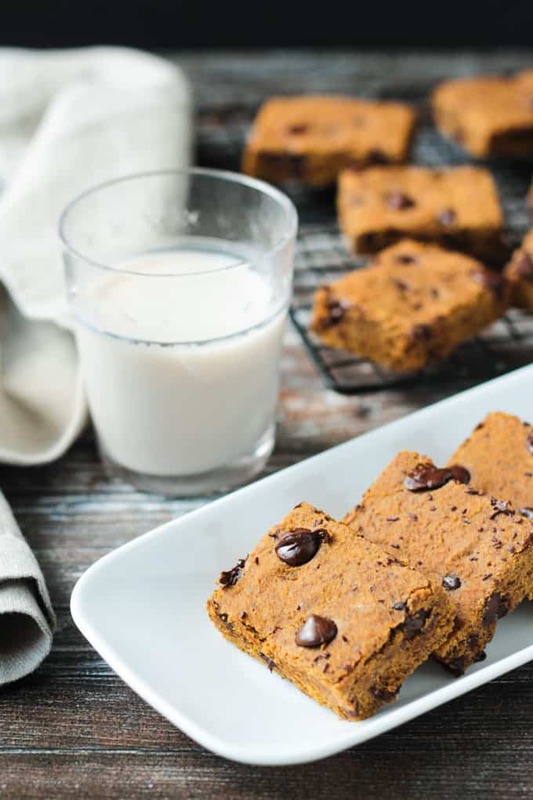 We are getting things started around here with these soft, cake-y Pumpkin Chocolate Chip Bars! My kids can’t get enough of these! My kids go crazy for little snack bars like these. My Banana Chocolate Chip Snack Cake and Chocolate Chip Zucchini Bars are some of their favorites. 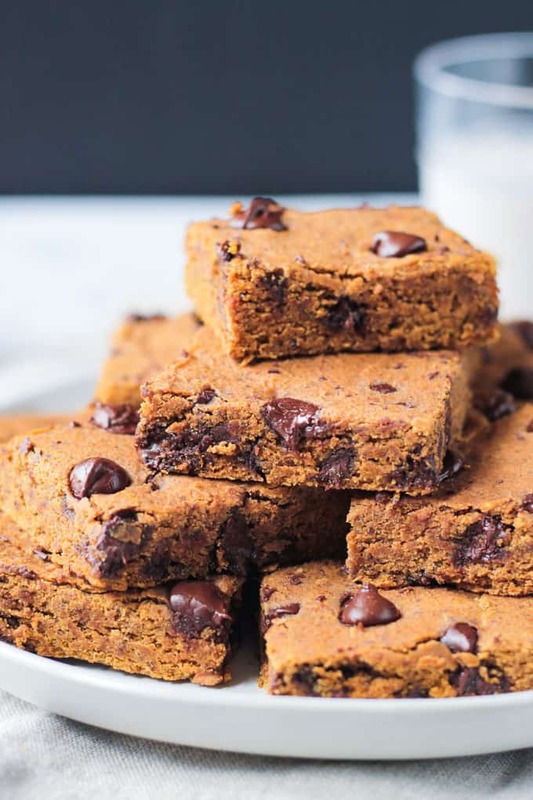 The texture of these Pumpkin Chocolate Chip Bars are very similar to both of those. Dense, yet soft, and perfect with a cup of coffee or almond milk. My kids love to take them in their lunchbox for a little sweet treat. Pumpkins don’t just look good on your front porch, they’re incredibly good for you. These orange beauties contain fiber, potassium, vitamin C, vitamin E, and antioxidants. You can use pumpkin purée to replace oil in most baking recipes. Just make sure to use pure pumpkin purée, if you’re using canned, not pumpkin pie mix. These bars are super easy to make. No mixer needed…just some mixing bowls and a whisk. All that’s left to do is….devour! 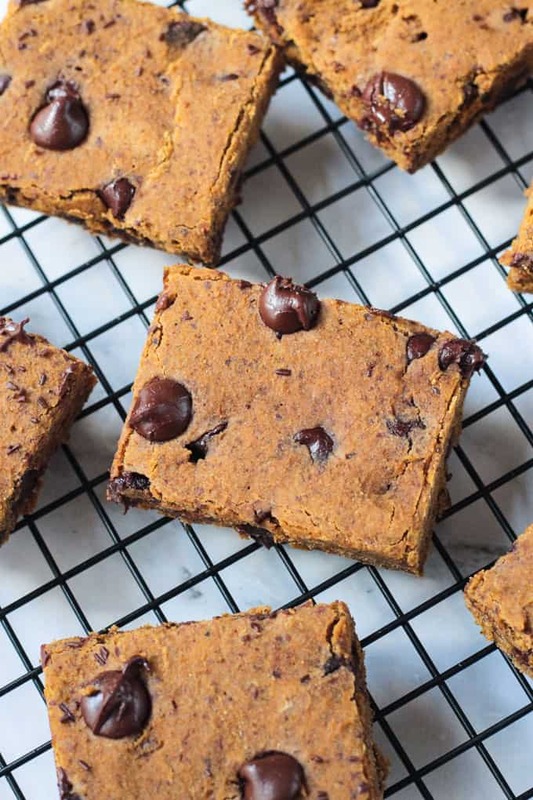 I hope you love these vegan Pumpkin Chocolate Chip Bars as much as we do. If you try them, please come back and leave me a comment below with your feedback and star rating. 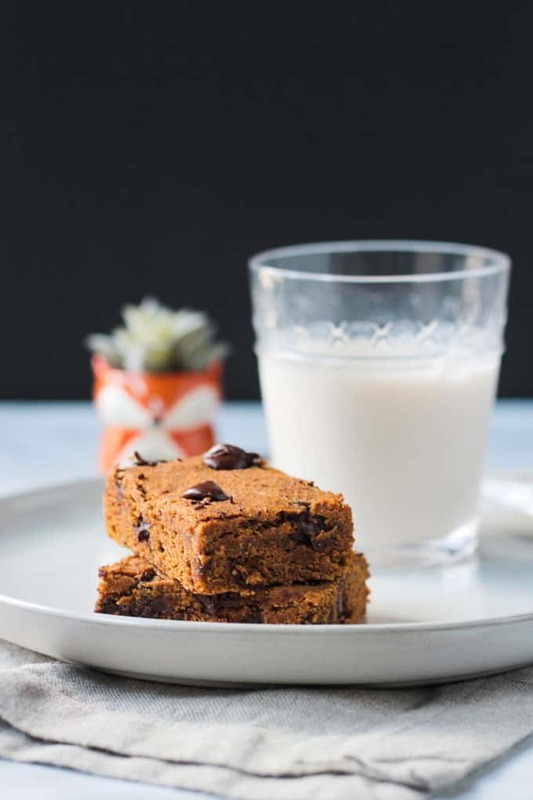 Pumpkin Chocolate Chip Bars - delicious dessert bars with all the flavors of fall and loaded with chocolate chips. Oil free and vegan. Line an 8x8 square baking dish with parchment, letting the ends overhang to use as "handles" later. In a medium mixing bowl, whisk together the flour, flax, pumpkin pie spice, baking soda, and salt. In a large mixing bowl, whisk together the pumpkin purée, coconut sugar, cashew butter, and vanilla extract. Pour the dry into the wet and stir to combine. Add the chocolate chips and stir to incorporate. The mixture will be thick like traditional cookie dough. Press the mixture into the prepared baking dish. Pro tip: slightly dampen your hands so the batter doesn't stick to your hands. Bake for 22-27 minutes until a toothpick inserted in the center comes out clean. Cool in the pan on a wire rack until cool to the touch. Using the parchment "handles" lift the whole thing out of the pan and place on the wire rack to cool completely. Once cool, cut into squares and enjoy! *You can use a 9x9 baking dish also. The bars will be slightly thinner, so make sure to check for doneness earlier while baking. Love this recipe! 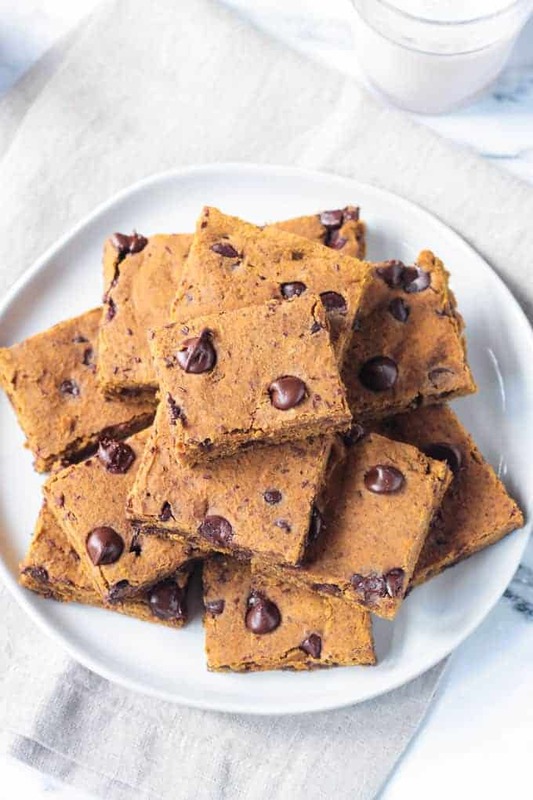 I notice a lot of plant based food bloggers have this same dessert dish/sweet treat of Pumpkin Chocolate Chip Bars, or a variation of it… but you’re one of the very few that include the yummy cookie-dough-like-flavors of Cashew Butter in the ingredients! I love Cashew Butter… although more expensive, I think it’s definitely the perfect compliment to blondies. I would love to know what your top rated (or top commented and/or requested recipes are on your blog. 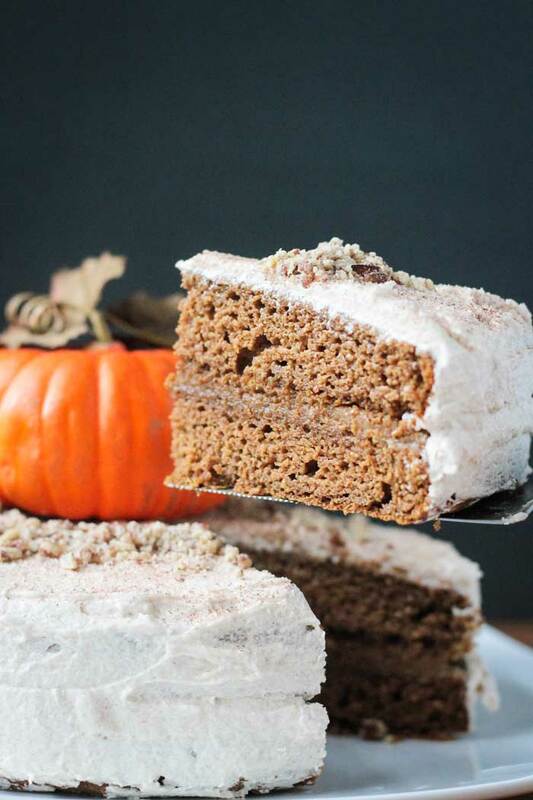 These pumpkin bars are perfect! They look so soft with those little bites of chocolate every once in a while sounds delicious. Thanks for the great recipe! I’m glad fall is here! So much pumpkin goodness! Me too, Mary! Love this time of year! I love the combination of pumpkin and chocolate together. I’ll have to try this recipe since it’s much healthier than the (non vegan) pumpkin chocolate chip bread I usually make! HaHa, Thanks, Jill! Pumpkin and chocolate were meant for each other! 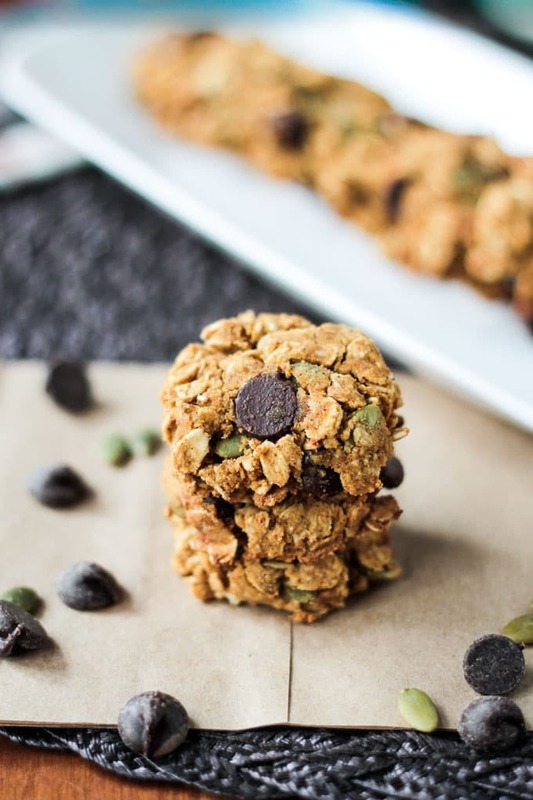 Adding chocolate chips to pumpkin is a genius idea! Thanks, Tisha! They are a match made in heaven! I just love pumpkin season! This treat looks delicious and I love that you included chocolate. Thank you, Ellen. Fall treats are the best! 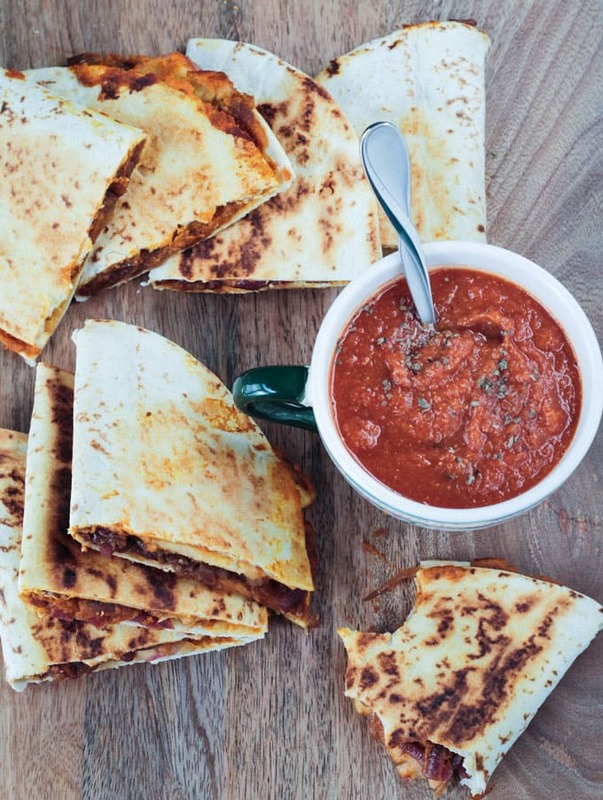 These look like the perfect Fall snack – we are loving using pumpkin in recipes right now. My kids would love these. I vote for pumpkin all year round! So good! Thanks, Bintu!